For tips, current conditions, and what the fish are eating! 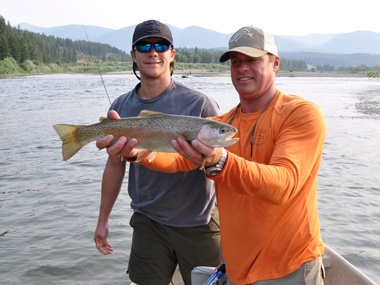 The Clark Fork River is the largest river by volume in Montana, although, you wouldn’t know it when fishing the headwaters. Up near Warm Springs, the river east of Missoula, compared to the section of the same river on the west side, can almost be considered two different rivers. The reason for this is that west of Missoula, the Bitterroot, Blackfoot and Rock Creek have all joined, in turn, greatly increasing its volume. 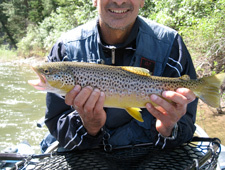 The upper third of the river (east of Missoula) could be characterized as a small meandering stream, with a population of predominantly brown trout. As it joins up with Rock Creek, it starts to broaden as does the species of trout you may encounter: rainbow, brown and cutthroat trout (Oncorhynchus clarkii lewisi) are all common. At this point, the river reaches Missoula, where you can literally step down off the road and catch wild trout. As the Clark Fork River leaves Missoula, it continues to grow, as the Bitterroot joins up. From here to where it joins with the Columbia River, is a total length of 310 miles. The river species here is primarily big rainbow trout. 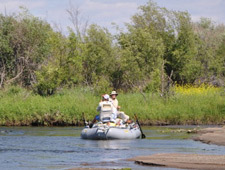 While Clark Fork River fly fishing could be a little more technical water, while fishing on the surface; it can well be worth the effort. Even if we only consider the Clark Fork River for fly fishing it would be reason enough to spend the week fishing in Missoula Montana. The tributaries of the Clark Fork include: the Bitterroot River, the Blackfoot River, the Bull River, Rock Creek, and the Little Blackfoot River. 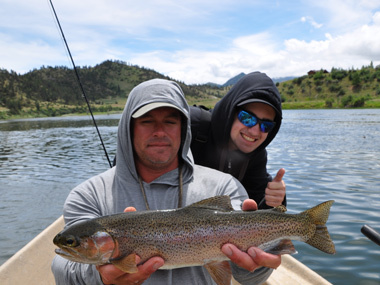 Get more information about our guided fly-fishing trips!